One perfect shot between the eyes of Dalia Margolis. In decades past, she ruled the runways of fashion week. She wore a blood-soaked gown to her final show. She’d used her retirement from the world of fashion to become one of the world’s most influential power brokers. That kind of life curates some potent enemies, and they’d hired me to kill her. Hitman is the eponymous latest recent game in the 15-year assassination franchise. Players can expect it to be doled out in several chunks, the first of which launches today on PC, PlayStation 4, and Xbox One. The series has a reputation for sprawling maps and the intricate, fly-by-wire plans strategies you’d need to eliminate your targets, and this release is no exception. The Margolis assassination mission, “Showstopper,” takes place during fashion week. With little more than a suit and a garrote, you’re sent to conquer her labyrinthine Parisian palace in the middle of one of the biggest shows of the year. Powerful sheiks, countless supermodels, and a sea of gawkers and journalists stand between you and Dalia. Before the assignment, you can pick a few pieces of kit—a gun or two, sometimes a lock pick—and then you must plan your approach. As the game progresses, however, your circumstances can change. You may miss time-critical moments here, and uncover new ones there. Linger too long in a bathroom stalking your prey, and she might walk off to greet some worldly businessman—or you could eavesdrop on a moment where you could catch her alone and defenseless. From the outside looking in, that’s a disconcerting way to talk about a character, and to be sure, Hitman does get creepy. But the tension of being caught as you plan cold-blooded murder shouldn’t be anything but creepy. The thrill that is the game’s soul comes in jarring doses. Tense seconds, between coldcocking the garcon and the probing footsteps of a patrolling guard. In those precious moments, a scheme you’ve been working for twenty minutes can fall apart, and it’s there you’ll make the choices that could save or scrap your run. These moments work so well, in spite of this first episode’s limited runtime, because each time you play you have dozens of options. Each of the three missions in this initial release is packed with different ways to approach and weak points to exploit that are all brilliantly layered. The sheer scope and potential of each level push you to explore more, and as you do your knowledge and mastery of the game grows, leading to yet more opportunities. It’s a crafty way to stretch out the handful of stages without any of them wearing out. It’s no exaggeration to say that there are a couple dozen, if not more, ways to complete each map, and they’re all distinct enough that each feels fresh. Some might find that complexity intimidating, but developer IO Interactive have included some new features to help acclimate freshman players. As you traipse through levels, you may overhear bystanders chatting. Sometimes, it’s nothing, but when it does matter, Hitman can give you the option to track their suggestion, giving you waypoints to follow. These opportunities can open up new vulnerabilities for your targets, or provide a more effective disguise. Veterans can turn these off, of course, but they’re a nice nod to accessibility. These tips and pointers help show the full depth of Hitman‘s stages, and show off the game maker’s wonky sense of humor. Thrilling as constant stalking might be, it can get exhausting without a few shots of levity, and Hitman has plenty. While you can poison a target’s drink and follow him while he vomits in the nearest commode, you can, just as easily, crush him with a speaker. Or detonate a television crew’s camera during an “interview.” As often as Hitman takes itself seriously, it allots zany tools fit for its elegant sandbox. Rampant bugs can put a damper on the joyride, though. Often, characters won’t show up where they should, and completing mission objectives won’t always work. During one segment, while disguised as fashion icon Helmut Kruger I was told to “walk the catwalk.” So I did. Twenty or so times. I finally gave up and lobbed a bomb into the crowd. Mission accomplished, after a fashion. 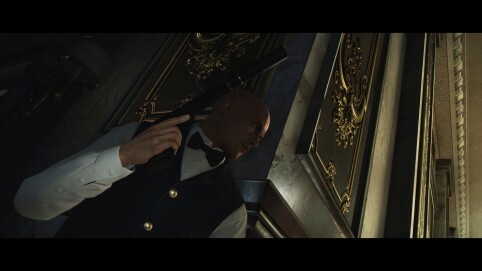 Hitman, the franchise, has always been known for elaborate assassinations and long missions that flow beautifully from one moment to the next. And it’s wonderful to see the subtitle-free sequel keep to that tradition. This is only the first of several planned episodes, but one with an emotional rollercoaster with enough depth and challenge to last some time.